TransMékong with Bassac Cruises is the very familiar name for serving cruise trips in Mekong Delta for years. The main routes that operated by TransMékong are Cai Be – Can Tho, Can Tho Trip and Can Tho – Cai Be. The cruise trips in Mekong Delta with TransMékong open the new view to passengers by river way for travelling and exploring. There are the famous destinations that you visit along. There are the local delicious dishes that you will and taste on board and view of the landscapes which the cruise passes through. 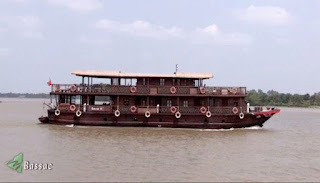 It is an amazing experience for anyone about the Mekong Delta’s trips. 1. Day trip: There are different day cruise trips for you to enjoy. You may have the breakfast trip in Cai Rang Floating Market, Phong Dien Floating Market, lunch cruise and sunset cruise. Even you may choose the dinner cruise and the cruise by night for experience the special moments on the river when the night falling down. 2. 2 days 1 night trip Can Tho – Cai Be: You will have chance to cruise on Mang Thit and Co Chien Rivers. This is the wonderful time for viewing the countryside life on day along the rivers. It likes another side of the Mekong Delta’s life naturally and purely. It is fresher than you may know before. In this trip, you also have a boat trip through canal in Cho Lach in Ben Tre where you will enjoy the wonderful pictures of orchard gardens. And then there are some minutes for visiting Cai Be’s handicraft to know more about the local work and the products here. There are other itineraries that you may concern more than Can Tho – Cai Be Route such as My Tho – Can Tho, Can Tho – Chau Doc, Can Tho around 2 days, Cai Be – Can Tho etc. So you have different choices for departures. Please check from us the departure details as you wish to have for reference before cruising. 3. 3 days 2 nights trip: Beside the typical trips 2 days 1 night, there are the 3 days 2 night cruise trip for you in the case that you love to spend more time on rivers. Base on the main details like in the 2 days 1 night trip; you will have more destinations for visiting, more activities to experience. You will have more chance to explore the Mekong Delta’s life with its rich resources of the landscapes and local culture. Restaurant with comfortable seats for meals and viewing. Passengers can access to TransMékong website to check it out the itinerary and time table available or have been consulted before choosing a trip. You may ask the agencies who are partners of TransMékong for help in the case you do not access to main website or office of TransMékong. All information and rates are transparency and adherence to the principles of TransMékong. Passengers are required to inform to the cruise the full name, date of birth, passport number, and nationality. Passengers are required about the check in on time as specified note to be sure the time of departure.